Chorus enable businesses to exploit the power of technology for commercial gain, offering comprehensive software, development, IT consultancy and creative design services. 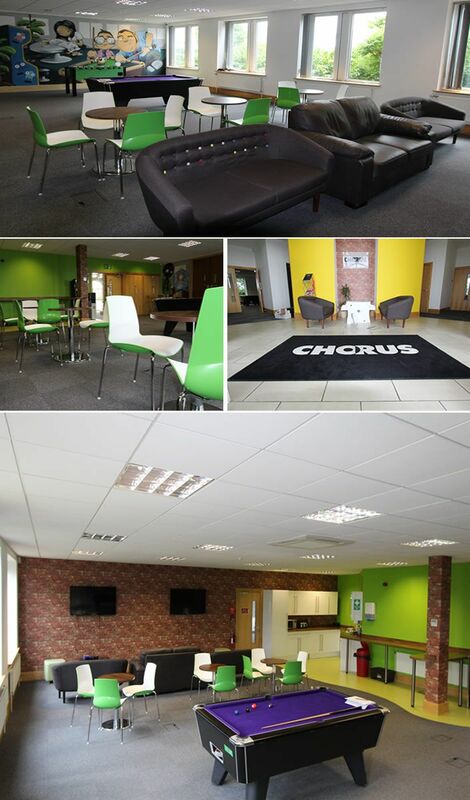 Bristol based Chorus approached Cafe Reality with a requirement for a welcoming break out area. Their aim was to create an area which promoted collaboration whilst injecting fun and colour providing a place to unwind from the stresses of work life. Designing a breakout space with collaboration in mind provokes the idea that the space needs to be hospitable enough to hold many different types of meetings. Providing relaxed, flexible furniture is important and helps to ensure that staff continue to use the designated space. Our clients were presented with a wide choice of next day café tables, eventually deciding upon the 'Rocky' Café Table - a robust, stylish chrome base and column provides the foundation, complemented by a durable 25mm white melamine (MFC) top. The two tone design ‘Track’ Polypropylene Chair was nominated to complement the tables. It’s sleek, glossy design lent itself impeccably to this project, concurring with all the clients specifications (comfortable, durable and a design/colour that would match with the bright green interior). ‘Rosanna’ Retro Sofas in a slate grey design were selected to create a simple, yet inviting seating area where employees could break away from the stresses of work life and watch T.V. “Our staff value their breakout room and found the tables and chairs provided by Cafe Reality stylish and comfortable. In addition to this, the superb aftercare service was friendly and very helpful. Do you have a similar brief or project you are considering? We would love to hear from you!